Roxanna Smith (from left), Tom Reed, Scott Fisher, Kelly King and Robin Knox all received awards at Sierra Club Maui’s annual meeting Feb. 25. 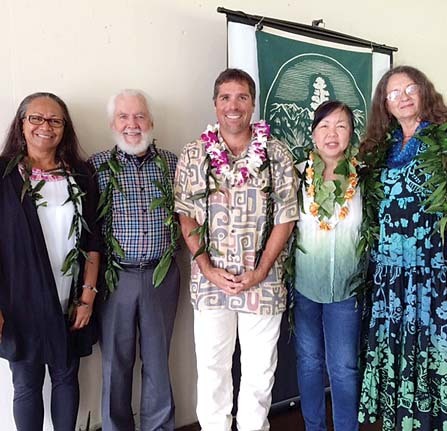 Sierra Club Maui honored five members during its annual meeting Feb. 25 at the Paia Community Center. Roxanna Smith and Tom Reed both received the Malama i ka Aina award for their work to reduce the impact of waste on the island; Robin Knox received the Malama Kahakai award for her efforts to research and protect ocean water quality; Kelly King received the Onipa’a award for her lifelong work to get Hawaii off fossil fuels; Scott Fisher also received the Onipa’a Award for his lifelong work to protect Hawaii’s most special and beautiful areas; and the Wailea 670 Trail Crew was honored with the Volunteer of the Year award for its dedication to clearing the trails and making them accessible to hundreds of people through Sierra Club Maui’s outings program (mauisierraclub.org/hikes). 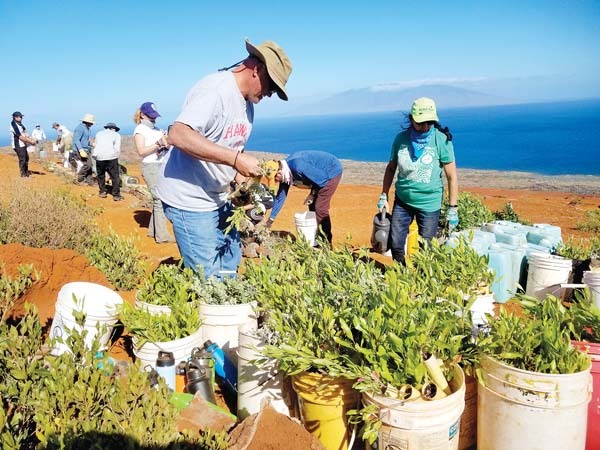 The Wailea 670 Trail Crew includes: Buck Joiner, Barbara Kaneshige, Liz Ebner, Amy Fazzari, Peter Drinkovich, Duane Sparkman, Ashford DeLima, Colleen Curren, Nan and Steve Jackson, Jeanne Schaaf, Amanda Hess, Alexa Deike, Gammy Arenasa, Nio Kindla and Lucienne De Naie. All of the lei given to awardees were made by Vernon Kalanikau and Jacob and Stephanie Noury with ti leaves from Lucienne De Naie and Daniel Grantham. Featured presenters Tara Owens of UH Sea Grant and Matthew Gonser of Honolulu’s new Office of Climate Change, Sustainability, and Resiliency gave presentations on the impacts of rising sea levels and how the Office of Climate Change is working on Oahu to make that island, and all of Hawaii, more resilient in the face of climate change.